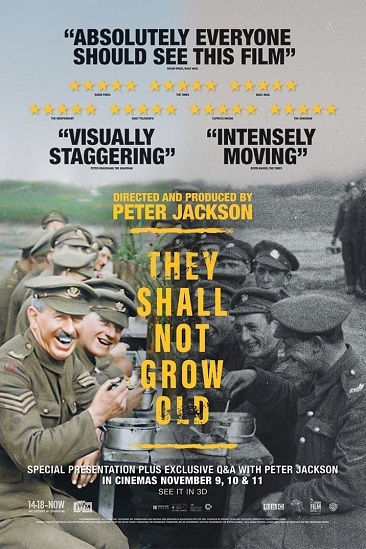 You and a guest are invited to a 3D advance screening of Peter Jackson’s new acclaimed documentary They Shall Not Grow Old. Click here to download complimentary passes to the advance screening being held on Tuesday, January 29 at 7PM in Salt Lake City. (Passes admit up to two, while supplies last. Passes do not guarantee admission as theater is overbooked. Arrive early for ticket exchange with box office.) We’ll see you there! Synopsis: From Academy Award-winning filmmaker Peter Jackson (The Lord of the Rings, The Hobbit) comes the groundbreaking documentary They Shall Not Grow Old, presented on the centenary of the end of the First World War. Applying state-of-the-art restoration, colorization and 3D technologies to century-old footage—carefully chosen from hundreds of hours of original Great War film held in the archives of the Imperial War Museum (IWM), Jackson has created an intensely gripping, immersive and authentic cinematic experience. The only narration comes from Great War veterans themselves, selected from over 600 hours of BBC and IWM archive interviews, resulting in a gripping account of “The War to End All Wars,” told by the soldiers who experienced it.